The DB2 is green! Having color on the car is obviously a huge milestone in any project. Now we can see the result of all that preparation. The body has already been color-sanded. The final grade of sandpaper used is 2500 (that means 2,500 ‘grits’ per square inch’) but then the paper gets turned over. Yeah, the backside of the paper is used to start the polishing process. You might laugh but it really makes a difference in the ease with which the paint buffs up. And by the way, the careful technique that was used earlier while blocking the primer flat still applies even though the sandpaper being used is so much finer. 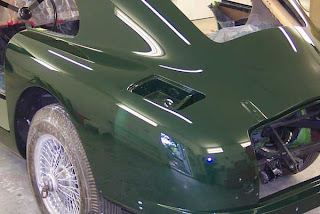 Many good paint jobs have been ruined by careless color sanding. Compounding (the color sanding scratches are removed) is followed by polishing (the fine haze or, ‘swirl marks’ left by the compound are removed) and the result is a deep, sharp shine. Why is so much time, money and attention given to wave-free body work and perfectly level, shiny paint? It’s only when the surface of the paint is free from waviness and the defect known as ‘orange-peel’ that the lines and curves of the car can be fully seen and appreciated. So even an admittedly dated design such as the DB2 looks striking when you stand back and see the way the lines and curves flow and blend. We still have to paint the firewall and chassis before we can start reassembling.